In my last post, I mentioned that I didn’t mind having dandelions in my prairies. Here is a further celebration of this beautiful, tough little plant. 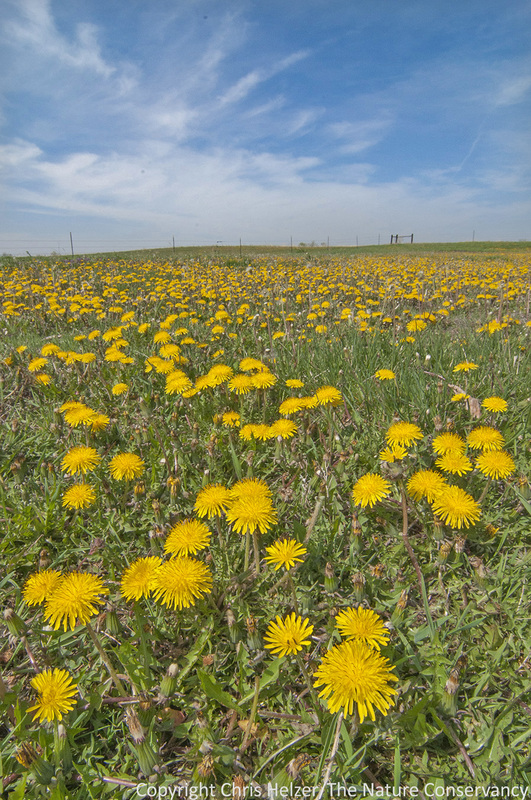 These dandelions were blooming near our shop building earlier this week. While dandelions (Taraxacum officinale) are kind of weedy, they are not invasive – at least not in our prairies. They essentially fill spaces left when perennial plants are either absent or weakened. Typically, they come and go from the plant community pretty quickly, except in places (like around our shop) where frequent mowing and/or poor soil conditions prevent more competitive plants from establishing. The dandelion’s status as a non-native plant doesn’t bother me in the least. It is an attractive species and is great for pollinators – especially in the early part of the season when few other plants are blooming in our prairies. Until relatively recent history, dandelions were seen as a useful and attractive garden plant around the world. We’ve made the social decision to call it a weed, but that doesn’t change it’s ecological value. You can read more about the history and uses of dandelions here. Dandelions and henbit (another pretty and innocuous non-native flower) offer a nice counterpoint to each other, don’t they? If you can get past the social aesthetic of dandelions as weeds and look at them as just a flower, they’re really very pretty. 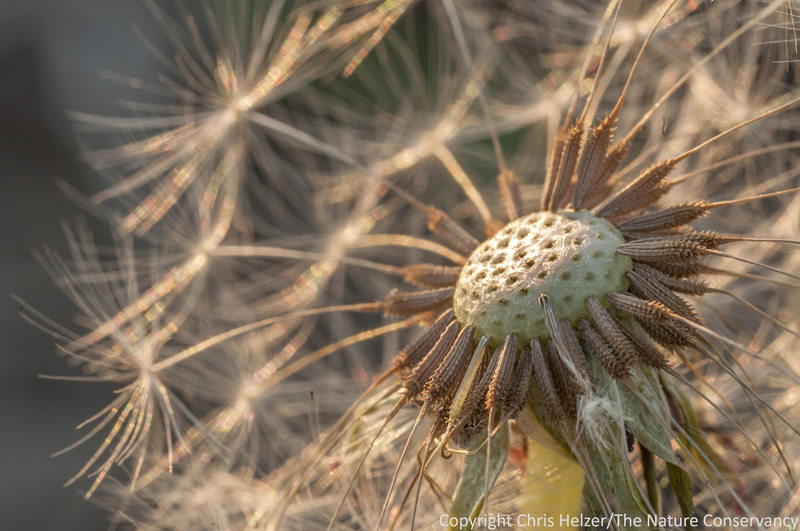 Kids, who haven’t yet been pressured to label dandelions as a nuisance, can see that beauty – why can’t we? Dandelion seeds at the Helzer Prairie last week. 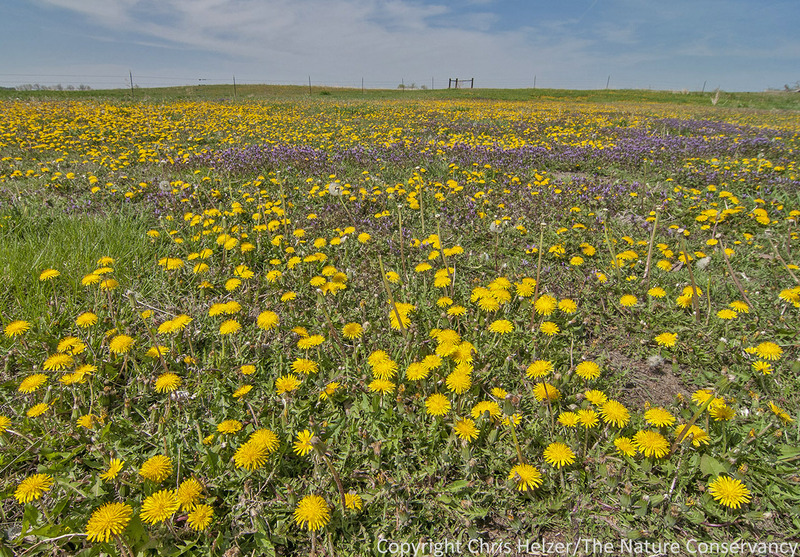 This entry was posted in Prairie Photography, Prairie Plants and tagged dandelion, grassland, image, photo, photography, pollinators, prairie, seed, uses, weed by Chris Helzer. Bookmark the permalink. Funny timing on your post. Yesterday I thought to myself while looking at all the dandelions in my woodland project “no biggie they’ll be gone in a few years”. Now the brome coming back was bothering me. My attitude is just opposite in my lawn – the dandelions stick out and I want them gone and any brome gets mowed down and I don’t notice it. I guess it’s all about the context of native area vs lawn. Mike – I currently shoot with a Nikon D300s and a 105mm Nikon macro lens. I like both very much. I’m glad you like the photos! I could never accept the destruction of dandelions. Glad to hear they are compatible with our prairies. Love them everywhere but in my lawn. Not sure about the colors in the dandelion seed photo, but wonder if they may be Taraxacum erythrospermum instead of T. officinale? When my wife and I were newlyweds 45 years ago we rented a place with hundreds of dandelions in the “lawn” and we made the most of them — ate the tender new center leaves in salads, experimented with steaming them as greens and studied up on making dandelion tea and wine (but never managed it). Later I suffered briefly from suburban lawn snobbery and was busy with a dandelion digger (note that there was a special tool designed just for dandelion roots — this was years before the advent of noxious “weed and feed” chemicals). Now I wish I had some, but they won’t grow in my shady yard. Thanks for your detailed defense of the dandy lion or “dent-de-lion”. Like many things, the invasiveness of common dandelion appears to depend on your location. In Alaska and Japan biologist are concerned about this species effects on the native dandelions and other species. I think if you showed a photo of a field of dandelions after they had gone to seed you would have elicited a different response from your audience. This only proves that aesthetics are subjective. I use herbicide to control dandelions in my yard to prevent my yard from becoming a foot tall blanket of fuzzy seed heads. If I “nip them in the bud” and keep my lawn healthy I only have to spray about twenty each year. Since I spray individual plants I use an unbelievably small amount of herbicide. This also allows me to not harm the native violets and nitrogen fixing clover. I agree the ‘weed and feed’ lawn care programs are obnoxious. There are a number of native species that become collateral damage with such indiscriminate spraying. I also do not understand why everyone must fertilize their lawns into such an unnaturally dark shade of green. It seems everyone feels they must put out a neon green door mat from house to street. Next they remove the best benefits of having a healthy lawn by scalping the grass to just above ground level. I only fertilize enough to keep my lawn thick and healthy which reduces weeds and mud on my feet after rain. Once my clover spreads more I hope to retire fertilizer altogether. It is really fun to watch the sparrows and goldfinches tackle a dandelion seed head and eat it up. Dandelion (Taraxacum officinale) is probably the world’s most recognized forb. It is relentlessly attacked the world over by lawn lovers and those who are fans of sterile homeowner-styled novel ecosystems. Herbicide commercials make Dandelion appear to be a dangerous weed that will make that crack in your sidewalk bigger by the day, all the while brainwashing you into going to the store and buying some high-dollar poison to spray on a little, harmless plant that just so happened to be tough enough to grow in the crack of your sidewalk outside of its native habitat. I applaud Dandelion. It is tough, naturalized, and it’s here to stay. Don’t fight it. Enjoy it. It adds to our dwindling biodiversity. Hm, it seems the reblog feature went kinda crazy this morning. Not that I meant to reblog your post, Chris, meant to link to it in a draft. Feel free to delete and rid the clutter. I actually got a picture of a clearwing hummingbird moth nectaring on a dandelion today. The moth doesn’t have much to choose from so early in the season.